NEW BRITAIN - It hasn’t been the second half the New Britain Bees imagined for themselves heading down the stretch. After finishing second in the Liberty Division through the first portion of the season, the Bees are out to just a 16-17 record in the second half entering Friday, ahead of only the Road Warriors (6-27) in the standings. With just five games separating the Bees and the top-seeded Long Island Ducks, there is still time for a late-season run if they can fix their weaknesses and build on their strengths. New Britain simply hasn’t gotten it done on the mound in recent weeks. 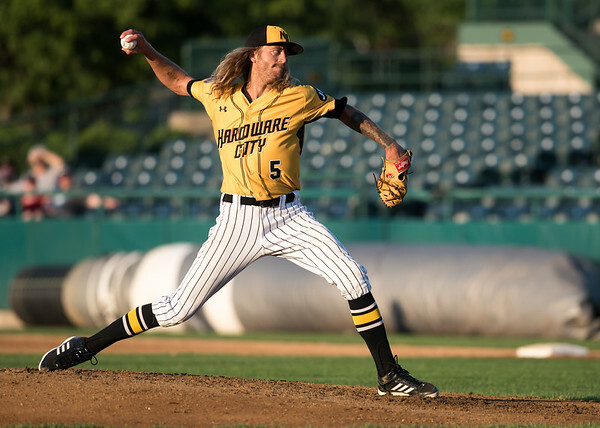 In the last 30 days, the Bees have three starting pitchers - Mark Hamburger, Kyle Simon and Rainy Lara - with ERAs above 4.00 and gone just 7-10. Hamburger and Simon are both over 6.00 and rank in the bottom-six in the entire Atlantic League during that stretch. Much of the struggles from the mound have to do with the loss of some key arms. New Britain’s two best starting pitchers this season - Zach Stewart and Andy Van Hekken - both are no longer with the team. Stewart (6-3, 3.42 ERA in 11 starts) was picked up by the Toronto Blue Jays just before the second half began after leading the Bees starting rotation through the first two months of the season. Van Hekken (5-6, 3.44 ERA in 17 starts) signed a contract with the Uni-Lions in Taiwan on Tuesday, concluding his time in New Britain. In five of Van Hekken’s losses, the Bees scored one run or less. When the starters actually do keep the Bees in the game, the bullpen has found ways to close out games. In the last week, New Britain has seven pitchers who haven’t given up an earned run - all seven have come out of the bullpen. The success late in games on the mound comes as no surprise. For the season, the Bees have had nine relievers with ERAs at 3.00 or below. Despite being one of the least productive offenses in the league - New Britain ranks seventh of eight teams in runs scored (440) - the offense has exploded in the second half. In 33 games since the break, the Bees have scored five-or-more runs 16 times. In those games they are 13-2. The bottom line is that the Bees have been run by their offense since the second half began. The best player in the Bees lineup of late has been leadoff hitter Darren Ford. In the last seven days, the outfielder has a batting average of .435 - leading the team and the sixth-best in the entire league during that stretch - and getting on base nearly half the time he steps to the plate. Jason Rogers has contributed to the offense as out of the cleanup spot, as he did in the first half. In the last month, he has hit .316, right on-pace with his .310 season average. He has been a model of consistency all season as he’s currently the team-leader in average, walks and doubles and second on the team with 54 RBI. The Bees have 29 games left in the regular season, but just nine of those games are against either the Ducks or Somerset Patriots, the two teams ahead of them in the Liberty Division. New Britain will have to take advantage of every one of those matchups to gain ground - if the season ended today, the Bees would be on the outside looking in on the playoffs. Posted in New Britain Herald, New Britain Bees on Thursday, 16 August 2018 21:19. Updated: Thursday, 16 August 2018 21:21.